PEORIA, Ariz. – The sun was barely up on Saturday. The Seattle Mariners were only just arriving. Jesus Montero, you remember him, was at his locker. His head was down, his eyes red and watery. There's a place a man goes when he must forgive himself for having been a boy, somewhere out past the weight rooms and ballfields and empty choices. 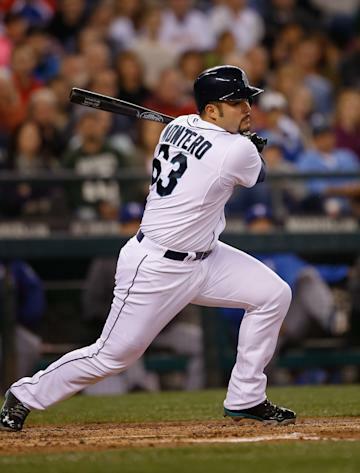 Jesus Montero, you sense, goes there a lot these days. When he returns, it's past the same weight rooms and ballfields and empty choices. Past his wife, Taneth, and his daughter, Loren. Past the father who paints cars for a living in Venezuela. Past the people who believed in him, and then didn't, and want to again. Past the boy. These are good journeys, if still painful. "I don't want to be a loser," he said. The uber-prospect New York Yankee and bust Seattle Mariner turned 25 in late November, seven months after his daughter was born. 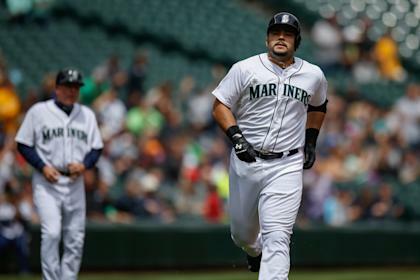 He'd been suspended at the end of the season for his part in a scrape with a former Mariners scout, an incident that famously featured a flying ice cream sandwich. He'd been suspended the season before as a result of the Biogenesis scandal. He was seriously overweight. What was developing then was a race between his eating habits and his life decisions and the opinions of others to see which would run him from the game. As Montero neared what was supposed to be his hardball prime, that race was too close to call. Maybe the game was too easy for too long. Maybe when the game got hard, and it always gets hard, he no longer recognized it. Or himself. By last spring training, coming off the drug suspension and into his most pivotal professional season, he'd grown to a puffy and largely immobile 275 pounds. Displeased, Mariners general manager Jack Zduriencik would tell reporters, "I have zero expectations for Jesus Montero. Any expectations I had are gone." What followed was a so-so minor-league season, another suspension, and the sound of an organization moving on. Hold all that up against the man at his locker Saturday morning. He was humble and apologetic. He was thankful for another chance. He also was a lean and proud 230 pounds, the result of an offseason spent in reflection and, day after day after day, in the gym. He had not made himself – remade himself, actually – into a capable ballplayer. But he was now free to find out if he could be. In that way, the months of sacrifice and work had merely delivered him to the professional standard, to a place deserving of a locker to stand in front of. On the second day of camp, and days before full-squad workouts would even start, that would have to be enough. "I think he's in a much better place as a human being," Mariners manager Lloyd McClendon said. "The baseball skills, we'll see." And so Montero seemed happy in the way you can be when you have worked for the happiness. He said he'd promised himself to be better in the eyes of his daughter, whose name is inked on the inside of his left wrist. Better, too, for his wife and for his father. For his teammates and their organization. Funny, too, somewhere in among the wind sprints and egg whites, the hard stuff, he found he loved the game the way he hadn't in a very long time. "What I mean," he said, "is just getting involved with all my heart all the time. Every second, every minute, every hour into baseball. So I can be the person that I am and then the player that I am. I love baseball, but I never loved it so much before." Twenty minutes later, the locker room was coming to life. Logan Morrison arrived. He is the first baseman. Nelson Cruz is expected any day. He is the designated hitter. That wouldn't seem to leave room in Seattle for Montero, but that will wait. The baseball will come or it will not, that outcome beyond so many more at-bats and so many more choices. He will learn whether he is good enough, now that he is deserving of the chance. I asked who was proudest of him today, before the first at-bats of spring. "First of all, my wife" he said. He paused. He took a breath. "Secondly, my dad," he said. He paused again, and took another settling breath. It was his father, also named Jesus, who would tell his boy in the worst of it to remember why he was here, but first to remember who he was in his heart, to be that man. "My dad," he said. "I say this to him the other day: 'I'm never going to disappoint you again. Let me prove that. Let me repair that.' "
Soon, the room was loud and crowded. Mariners greeted each other with hugs and silly handshakes left over from an 87-win season, with the promise for more in 2015. They cast an eye on Montero, the troubled Montero, then looked again at this new man before them. He smiled and they answered with astonished laughs. "It's funny," he said. "The way they look at me, they don't even recognize me. You know, it's an amazing feeling to walk into this clubhouse with confidence. "I've been learning from my mistakes. Now I just want to be good. I want to be humble. I want to win. And I'm not a quitter."